It’s easy to sync iTunes Music to your iPhone, iPod touch or iPad, but it’s a difficult task to sync your iTunes music library to android device. If you are recently moved from iPhone to Android device and want to sync your iTunes Music to your new Android Device, than you have to try new Android App iSyncr Lite. 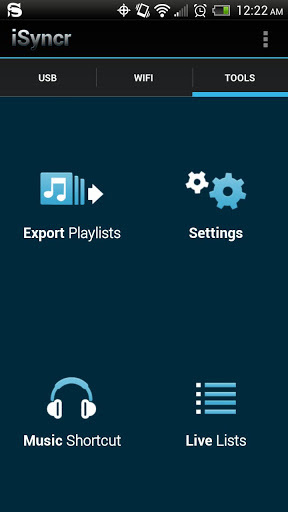 iSyncr Lite is free app available for Android users which allows them to quickly sync Android device with the music they have in iTunes using a simple to use interface. So if you want to change your iPhone device to Android mobile, you must try this free app to sync all your iTunes music with your new Android device. The app works directly with iTunes so you can sync hassle-free. 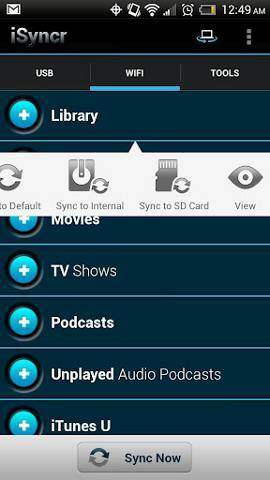 With the help of this app you can sync your music, podcasts and videos to your Android device over USB or WiFi. It’s a bundle of two apps, one for your android device and one for your PC. First install the app on your device, after the installation it will prompt you to download the app on your Windows PC to get started. After finishing the installation you can connect your device with your Windows PC via USB or WiFI. Now just run the app and, pick up the playlists that you want to sync on your Android, and let it go. It works with any music app on your phone, will sync iTunes’ album art. All you have to do is select the internal and external memory from which drive each playlist syncs to. Note: This app will not sync copy protected music or videos but will alert you to which songs will not play be synced to your device. As we mention above it’s a free version, os it has some limitations, it will sync one playlist at a time. To remove these limitation you have to buy the pro version from the Google Play store.